Our experienced weight loss doctors may prescribe appetite suppressants to help you achieve your weight loss goals. These medications aid in reducing feelings of hunger while increasing satiety—the feeling of being full. Many patients find that during a weight loss program, feelings of hunger or starvation can make it difficult or impossible to maintain a calorie-controlled diet. Appetite suppressants can often eliminate these feelings, making it easier to follow the program and lose weight. How do weight loss drugs work? Weight loss medications are typically available as tablets or extended-release capsules. By increasing serotonin or catecholamine levels—two brain chemicals that control mood and appetite—appetite suppressants can often fool the body into believing that it is not hungry, or that it is full sooner. As a result, you eat less, helping you lose more weight. One commonly prescribed example is phentermine, also called Adipex®. Weight loss medication is designed to be an aid to your weight loss program. These pills can help provide gradual and steady weight loss, usually about one to two pounds per week. Not all types of weight loss medication are appropriate for all patients, and our team will review your medical history and discuss your concerns to determine which, if any, medications can optimize your goal. How much weight can I lose using diet pills? Typically, appetite suppressants on their own are moderately effective, generally resulting in 5-22 pounds of weight loss in a year. Greater weight loss can be achieved by modifying the diet and increasing one’s weekly amount of exercise. Without behavioral changes, however, weight gain commonly re-occurs once you stop taking them. Our comprehensive approach to medical weight loss can help you develop lifestyle strategies to eat healthier, control your appetite, and improve your fitness level. In combination with appetite suppressants, these behavior modifications can help your take control of your health and your life. If you have tried to lose weight through traditional means and have struggled to see any changes, prescription weight loss medication may be able to help. Careful evaluation will be made if you have diabetes, high blood pressure, high cholesterol, heart disease, sleep apnea, or another medical condition. Having one or more of these conditions does not mean weight loss medication is inappropriate, although they will play a role in which type of treatment and how much will be prescribed. You should also be age 18 or older, have a body mass index (BMI) of 30 or higher (or 27 and higher with additional risk factors such as the medical conditions listed above). Some patients only require a short period of taking prescription medication to jump-start their weight loss while others may require long-term treatment. We will customize your program, adjusting it as needed to emphasize the most effective approach and to help you obtain long-lasting results in a healthy manner. 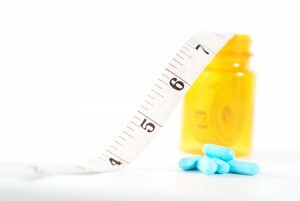 Does medical insurance cover the cost of prescription weight loss medication? Some medical plans cover prescription weight loss drugs and some do not. The best way to determine if your medical insurance will pay for your treatment is to contact your agent and review your benefits. Our team is happy to submit a claim for you and help you through each step of the process. In the event your insurance does not provide assistance, we work with a reputable weight loss financing company called CareCredit®. This company offers qualified applicants low-minimum monthly options, appealing terms, and low- to no-interest plans. You can fill out the application quickly and easily online, and there is no fee to apply. We can discuss this with you, if interested, during your initial consultation.